It’s end of the January and therefore a tennis time in Melbourne. Australian Open is in high gear; Melbournians and guests can enjoy watching top of the crop tennis athletes playing at their doorsteps. Have you even wondered what countries are the home of good tennis players? I’ve always been, so when had a bit of spare time conducted a small research. The results are quite interesting. Let’s first see absolute number of tennis player, like how many top tennis players are playing for different countries. 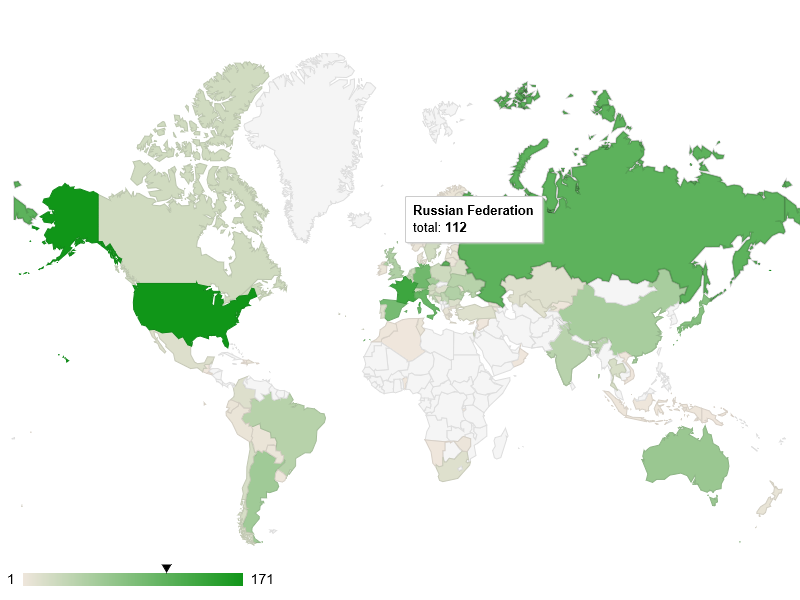 To find it out I took top 1,000 players from ATP rating (men) and WTA rating (women) and calculated distribution of these 2,000 tennis professionals per country. The results are presented in the charts below. 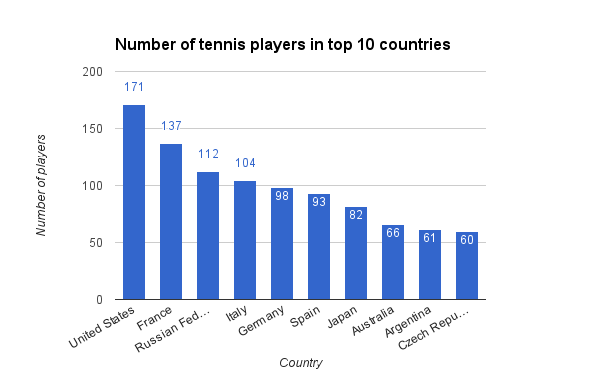 All together these countries provided almost half of 2,000 top tennis players. Six out of ten countries are European, two – Asian and APAC and two from Americas. Good to see Australia here at 8th place. I’ve also prepared an extended version of this information in the form of pie-chart with table, click here to view it in new tab. You can find there information about all countries with at least one man or woman in top 1,000. Finally, I created an interactive map that allows to see number of tennis player as an overlay on top of world map. It is also possible to customize the rendering, for example check only Europe. Well, all this is good, but what about relative performance of the countries, how many top tennis players they have per capita? It is probably more fair comparison, because there are giants – countries with over one billion people like China and India and tiny countries like Monaco with less than 40,000 residents. I bet that the chart below will be more surprising for you. 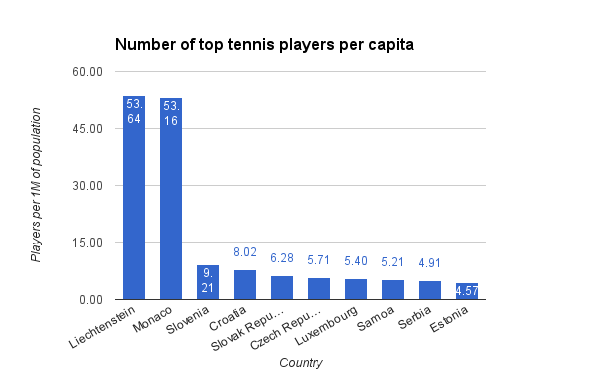 Top tennis countries, with the highest number of top tennis players per capita. The results are very different from the absolute numbers. Actually only one country has been listed in both top-10 charts and this country is Czech Republic. It is number nine in the first list and number 5 in the second. So probably Czechia can be called the most tennis country in the world. The chart below shows data of top tennis players on top of world map. It takes a while to load, so don’t be disappointed if you don’t see your country there immediately. Actually not so bad, with 2.81 to tennis players per 1,000,000 residents we are at 17th position. If you want to find out more specific information, click here to check the table with all countries data, sorting, search and filtering functionality. It is possible to get there for example countries with the highest number of top female players, in absolute values or per capita. You can also download the resulting data in CSV format.